What is your favorite kind of Japanese food? Food in Japan is greatly affected by location – Japan is surrounded by the ocean, so a very common food is fish. Rice is a staple food, grown locally in huge rice fields. Though rice is the stable food, many kinds of noodles, such as udon, soba, and ramen, are also common. On an interesting note, it was only in 2013 that UNESCO declared the traditional food cultures of Japan, known as washoku, as an Intangible Cultural Heritage. In other words, they only recognized it as something deserving to be preserved in order to keep the culture alive last year. But, something that I didn’t know, was when Buddhism came to Japan in the 6th century, it became taboo to eat all flesh of animals and/or fowl. Because of this, the vegetarian style of cooking known as shojin ryori introduced soy sauce (shoyu), miso, tofu, and other products made from soybeans to replace the animal products. Also coming from the zen buddhist tradition is the well-known simple and elegant display of the food that we still see today and I’ll describe a bit below. The sado, or tea ceremony, is highly ritualized and greatly influenced by Zen buddhism. The type of tea is a green tea known as matcha, which is powdered tea leaves. I won’t go in to all the details, even I don’t know them, but be sure that each movement is highly learned if it is done properly. This is one of three basic styles of Japanese cooking, which we will cover all three today. This one in particular is served during a tea ceremony. The foods served are fresh, seasonal, and usually local, and are prepared without decoration. 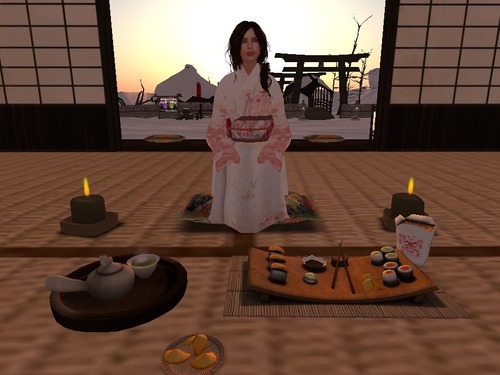 The meal is then followed by the tea ceremony. In this style of Japanese cooking the food is served carefully arranged on legged trays, as it would have been to the nobility during the Heian period (794-1185) when this style emerged. The menu usually consists of a soup with three types of side dishes such as sashimi (raw seafood), yakimono (broiled fowl or fish), and nimono (simmered veggies or meats). This is the minimum serving, sometimes they can be as large as three soups and eleven side dishes. It is important to ensure that foods of similar tastes are not served together. It is particularly important when attending a meal of this style to follow proper etiquette, most importantly eating a bit of rice before passing from one dish to another. Kaiseki ryori is regarded as Japan’s most exquisite culinary refinement. This is a multi-course dinner consisting mainly of vegetables and fish with a seasoning base of seaweed and mushrooms, the dishes are characterized by their refined flavour. There are two kinds of kaiseki ryori’s. The first is a set menu served on an individual tray. The other is the meal served before a ceremonial tea, known as cha-kaiseki. Appetizers: sweet alcohol or local alcohol and bite-sized appetizers. Main courses: soup, sashimi (raw fish), nimono (boiled vegetables, meat, or seafood in a mix of soy sauce, sweet cooking sake, and sugar), yakimono (grilled fish or meat), agemono (tempura – deep fried seafood and vegetables), mushimono (which is exactly what it sounds like…lol…a steamed dish. The most popular is chawanmushi, a savory egg custard flavored with fish stock with mushrooms, chicken, ginko nuts and seafood), and sunomono (vegetables and seafood in a vinegar based sauce). The next set is called Shokuji, which we don’t typically do in western cultures, but it consists of rice, miso soup and pickles (tsukemono). Dessert: can be anything sweet but is typically made up of local or seasonal fresh fruit or sorbet. Ochogatsu, or New Years, isn’t the best time to visit Japan since all the shops and restaurants are closed between Dec 28 and Jan 3. The time is spent in temples and shrines and with family. The chopsticks used during this time are pointed on both sides so the gods can partake in the feast of osechi-ryori. This is a dish of predominately vegetables with grilled fish, served in special boxes called jubako which resemble bento boxes. Many dishes can be served, so I’ll only name a few. They all have special meaning with regards to the New Year. Daidai, “from generation to generation,” is a bitter orange which symbolizes the wish for children in the New Year. Kamaboko is a broiled fish cake arranged in rows or patterns which resemble the Japanese rising sun. Konbu is a type of seaweed which is associated with the word yorokobu, meaning “joy,” and is used for wishing for joy in the new year. Ebi is skewered prawns cooked with sake and soy sauce and it symbolizes a wish for a long-life, symbolizing a long beard and bent waist. Hina Matsuri, or Girl’s Day, is celebrated on the third of March. The most stunning thing about it is the heirloom dolls that are display, and promptly taken down on the fourth since they are thought to delay the girls’ marriage if they are left on display too long. These dolls the caretakers of the girls’ health and happiness, warding off bad luck and bringing in good fortune. This is probably my favourite festival food wise, because they get mochi! Hishimochi are lovely, diamond-shaped mochi (rice cakes) with pink, white and green layers. Pink represents plum blossoms, in season in late February and early March. White represents the snow of the waning winter, while green represents the new, fresh growth of early spring. They also get sake, or rice wine. Shiro-zake is the first variety of sake of the year, available in early spring. White, unfiltered and sweet, it came to be associated with girls, (and thus, the festival) even though women did not necessarily drink sake in the old days. The pure-white color of the sake also compliments the pink of the plum blossoms. Red (or pink) and white also signify happiness and good fortune, and are often displayed during festivals. The next treat they get to indulge in is hina arare. Hina arare are small, blossom or snowflake-like pink, white and green balls of crunchy puffed rice, sometimes sweetened with sugar. In the old days, arare were made of leftover mochi from the Oshogatsu (New Year’s) festival celebration, and therefore, were often enjoyed during girl’s day. This thrifty and creative use of materials also came to symbolize the desirable qualities of a good wife. The Sakura festival is the world-renowned cherry blossom festival between the end of March and early April (depending on when they blossom). I was going to try to explain this phenomenon myself, but I found this quote and it’s just perfect, ” I had thought it was sentimental hype until I found myself in Kyoto one year during the height of cherry blossom season. The city was awash in pink; enveloping me and everyone around me with their delicate fragrance; the petals falling, fluttering like gentle rain on the sidewalks and onto the hair of young women in their sakura-patterned kimonos. Since then, I haven’t missed a single season.” The season is a time of change, a gentle reminder that the harsh winter is over. It reminds us of the fleeting nature of reality, a prominent Buddhist belief. Hanami bento is a homemade dish that most people take to the viewing of the blossoms and accompanying parties. These boxes include seasonal grilled fish and spring vegetables, rice with vegetables cut into the delicate shape of sakura petals, green yomogimochi (spring herb dumplings) and kamaboko (fish cakes) with pink designs. I watch the lovers walk hand in hand, and feel sad that I will not live long enough to do the same. The sadness pulls me down, I sway, I lean, I can feel the wind pulling on me. Eventually it succeeds and I drift slowly towards the ground. I fear the landing, the eventual end that I know will come. All the lovers, all the friends, and I regret that I will not see them again. “You’re in a roji (“dewy path”, a small Japanese tea garden) on your way to your friend’s tea house. As you mindfully step on granite stones freshly splashed with water for your arrival, you notice that the stone lanterns, lit for the evening, are shining a little more brightly than usual. You peer inside of one of them, and notice an extra candle. However, as you round a bamboo fence, the tiny and simple thatched roof teahouse comes into view, and you notice that the windows are dark, and find this a just a little odd. The tea house roof is so low that you have to lower your head as you enter the genkan. Despite your quiet arrival, your host welcomes you, opening the small shoji door for you to enter the four mat tearoom. In the dim natural light, you see the tokonoma, where a scroll painting of a moon, barley visible against the palest grey sky, and a bold arrangement of pampas grass and autumn flowers are displayed. It’s grown chilly in recent days, so you’re happy when your host invites you to sit close to the coals as he prepares the kettle for tea. Can you guess what festival this is representing? It’s o-tsukimi, the harvest moon festival! This usually falls in the middle of October, on the full moon. It is tradition to write poems to the moon. Shall we give it a try? Riding the back of a turtle. Longing for a taste of his grace. That is all for today! Phew! Any comments or questions?